Ten days ago at the weekend I was working from home - part of our new regime to avoid seriously hefty electricity bills at the studio. It is strange how things come in clusters. I have not been asked to make a dog coat for a long time, but on Saturday I had 5 to make! They all featured embroidery in some form or another, so that had all been done at the studio on Friday and I was simply putting them together at home. One of the coats was for a company called Highland Dog. They have recently had a new logo designed and wanted the logo embroidered onto a dog coat so it could feature in photographs on their website. I think it looks pretty good! The coat is made with Harris Tweed and lined with Dress Stewart cotton tartan. Another two coats were being made for them as well, but for one of their customers, and as I understand they are to be a Chirstmas present, I don't want to give the game away by posting the photographs here. Next up was one for one of our own customers. She had come to our studio with her mother a couple of months ago when her mother was discussing having Mary make her an outfit in some silk tartan and had spotted our little model dog coat. A few weeks ago she was back to choose tweed and place an order. 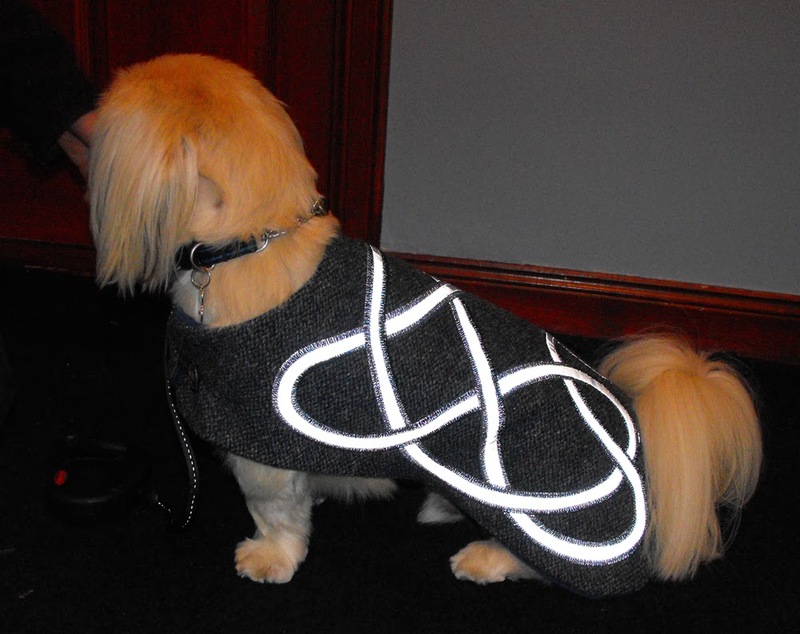 This coat features Celtic knotwork embroidery around highly reflective silvered fabric - ideal for walking the dog on these dark nights. It is lined with polar fleece - so really cosy. I got the coat finished on the Saturday afternoon and when I called her to say it was ready, she came round to collect it. Bobby came with her and was delighted with his new outfit though at first he was a bit reluctant to smile for the camera! The final dog coat remains a secret for the next few days as it is featuring in a fashion show that my daughter is organising - 2nd November at Bogbain, just on the southern edge of Inverness. 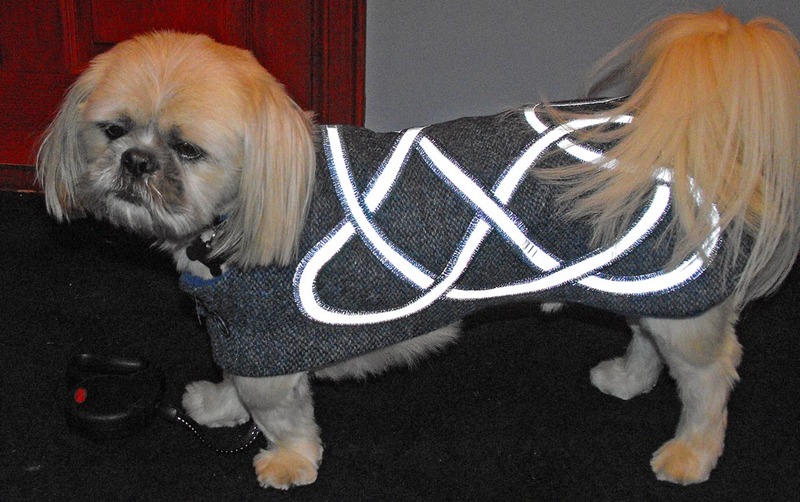 All our dog coats are made to measure so if you are interested, contact us through our website. Once the dog coats were finished, I had a complete change of direction and spent the rest of the weekend making Christmas decorations. There has been demand all year for both our Shetland Angels and our Celtic and Tartan Hearts, but we always need more in the run-up to Christmas. This weekend just past we had a stall at a craft fair in Strathpeffer. I arrived with an almost full basket of angels, but by the end of the first day it was obvious there were not going to be enough to see out the weekend. So Saturday evening was spent making more and they continued to fly out of the basket all day on the Sunday. Our next craft fair is at Eden Court in Inverness - 15th to 17th November - so we will be making more in time for that. But if you don't live anywhere nearby, just go to our website. These delicate little decorations are so light that they can easily fly anywhere in the world. I left Mary to do the packing up at the fair and headed across to Ullapool to catch the ferry to Lewis. 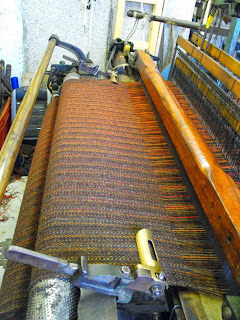 I spent a few hours weaving and am looking forward to finishing off this particular length so I can take it to Carloway Mill to be washed and stamped with the world famous Harris Tweed Orb certification mark. When I went to start writing this post I had a quick look at the blog statistics - data that tells you how many people have visited the site and where they come from. I was pleased to see that it has just topped 10,000 page views! But spread the word, share it with your friends, and do come back and visit regularly. I also welcome comments if anyone feels so inclined. While writing this, I am sitting in the marshalling yard at Tarbert, Isle of Harris waiting for the ferry to Uig on Skye. This is an extra sailing put on because the Stornoway to Ullapool ferry was cancelled. In theory the ferry was supposed to sail at 8pm but it is now 8.40 and the ferry has only just arrived. It will have to unload, so I can’t see it leaving before 9.15 at earliest - suggesting 2am before I get home to Inverness! So, the upside is that I have time to write something for this blog - first chance I have had in months. I have had a really busy summer one way or another. On many occasions I took photographs with the intention of including them here, but have had no time to edit them. This is me on my way home from another weaving trip - thankfully a very successful one. I arrived on the island on Tuesday and spent the afternoon making a new warp. 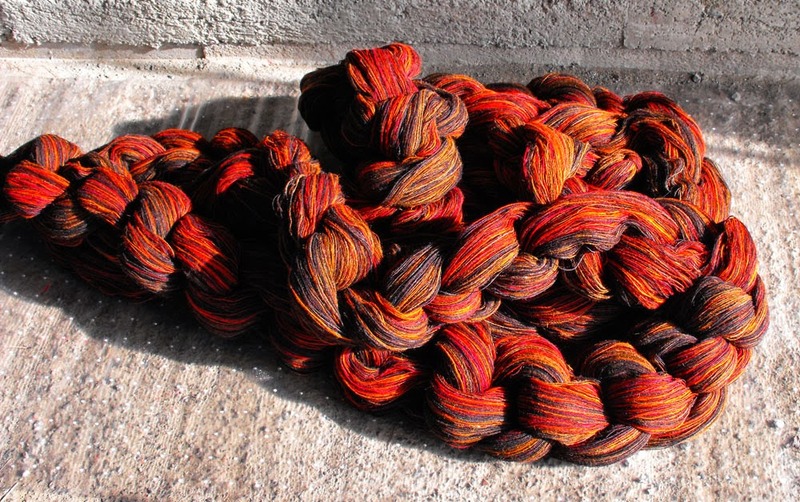 Inspired by the lovely autumn shades that glowed in the sunlight as I drove from Inverness to Ullapool to catch the ferry, I selected yarns in various shades of oranges, rusts and browns. 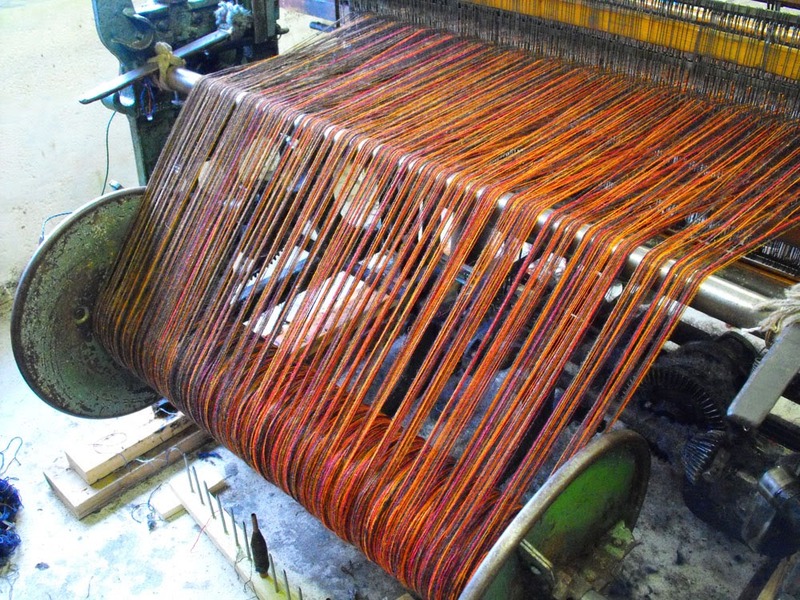 I have set the warp up so that it changes from one side of the loom to the other - mostly brown on one side, mostly orange on the other. On Wednesday I spent the morning in the kitchen making things to fill up Mother’s freezer. Spending this amount of time in a kitchen is not something I get to do very often and I really enjoy it when I get the chance. I made soup, apple pies and gingerbread. As the week progressed I did a few more things and now the freezer is packed full and should last until I get back at the end of the month. 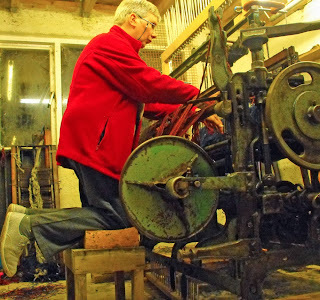 In the afternoon a neighbour came down and helped me beam the warp - the process of getting the prepared warp wound onto the back beam of the loom. It is a job made much easier by having an extra pair of hands so I was very grateful to Donald for his assistance. Once it was on, it was back into the kitchen to prepare our evening meal and then I started the tying-in process. Just before I came to Lewis I had visited another weaver - Sam Goates - who has a selection of looms at her studio in Buckie, including a Hattersley loom similar to mine. I had commented about how I found the tying-in very tiring and resulting in sore muscles both in my small of my back and my calves. She showed me how she does it - sitting on a very low desk chair. I thought it would be worth giving it a try but found that if the seat was low enough to get my legs below the beam, I couldn’t get my arms in the right position to pick up the ends for tying. However, I played around with various positions and finally settled on kneeling on a stool padded with a 3 inch thick piece of foam. I will need to speed up my technique though - it still took a total of 3 hours to tie in all 696 ends. On Thursday morning I headed off to the west coast to deliver an order to the Calanais Visitor Centre. Angus was pleased to see me as he had hardly any of our products in stock. There were some American visitors in the shop when I arrived and they were choosing things to buy straight out of the bags before he had a chance to put them on the shelves! 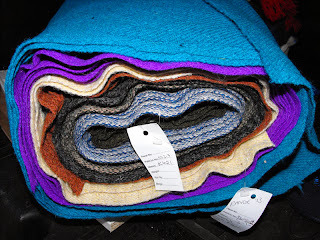 From there, I headed north to the Carloway Mill and bought some more tweed - another lovely selection which will be used to make hats and bags. In the afternoon I finished off the loom preparation and started weaving. My care with the warp had paid off as the weaving was trouble free. Over the next 48 hours I got several lengths woven enough to make about 20 scarves. However, it will have to stay on the loom until my next visit when I will weave the remaining 20 metres of tweed before cutting it off and taking to the mill for finishing. Something I have done that is making my weaving more efficient is that I developed a little database for my iPad. When I weave, I do enough length to make a scarf or wrap and then wind on an un-woven section which later becomes the fringed ends. It is important to get the right length, and as it is all wound on the cloth beam of the loom, you can’t easily tell how much you have done. People have various ways of working out how much they have woven, but I like to measure as I am going along. I measure each time I come to the end of a bobbin, which can be anything between 10 and 20 cm depending on the yarn I am using. Previously, I had to just jot down the measurements in a notebook and work out the totals. With this system on my iPad, I can just enter in the amount and it adds it up for me. I have also done it so that I can keep a photographic record of each length woven, and it shows me how many scarf lengths I have woven in each colourway. It is proving to be a simple and efficient way of keeping track. 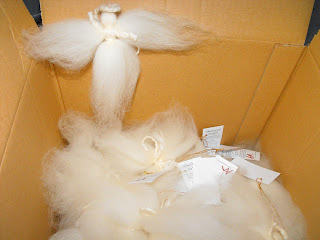 In the evenings I spent my time making more Shetland Angels. This is a job I really enjoy as they are made entirely by hand, sitting back in a comfortable chair, watching the telly as I work. These angels are heading to the Liquorice Tree at Edinburgh Airport and Highland House of Fraser in Inverness. Once I get home, I will be making more for stock to sell at the various craft fairs we will be attending in the coming weeks - see the website for more details. I am now sitting on the ferry, having enjoyed a good chicken curry in the ship’s cafeteria and watching the monitor which shows the position - just off the north end of the Isle of Skye, about to enter the bay. Probably about 30 minutes at the most to get to Uig. After that, an hour’s drive through Skye and then an hour and a half back to Inverness. I just hope that next time I come there is no such trouble. Mary is organising a charity fashion show on 2nd November, and as Anna Macneil will have things on the catwalk, I can’t be late for it! See Mary’s facebook page for more details. P.S. Arrived home at 2am after one of the most horrible drives - winscreen wipers on full all the way, nasty gusts of wind threatening to blow me off the road and in a constant stream of traffic on twisty roads in pitch black. Hello! At Anna Macneil, we are a small family team who design and make Harris Tweed fashion accessories and textile items for the home. We take our inspiration from various sources - history, landscape, nature - and create designs for embroidery. Everything starts life as scribbles and sketches on paper. How it develops from there depends on what it is, what mood we are in, which of us is doing the design - we all have different ways of working. 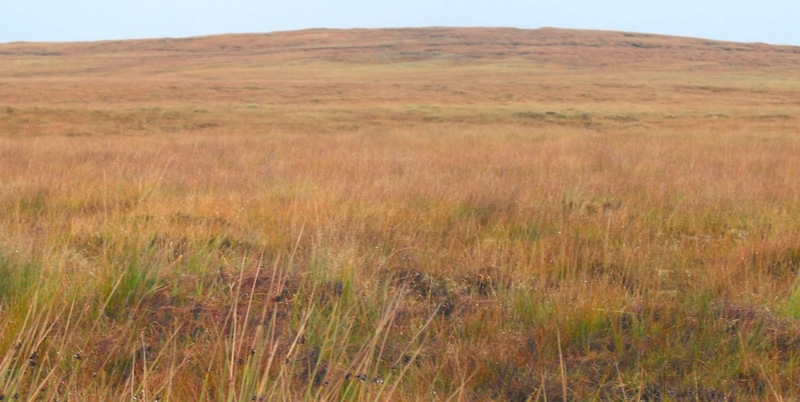 Our hats are designed to keep your head warm - and to not blow off in the wind! Our scarves are cosy as well as decorative. The bags and purses are all fully lined and have secure fastenings. The cushions have well stuffed, polyester filled, polycotton covered pads which we make ourselves and the covers are removable for cleaning. We also have our own particular interests. I do feltmaking (including teaching) and ecclesiastical embroidery in addition to our main work. Mary makes wedding and special occasion bespoke dresses, most incorporating tartans and/or Celtic designs. Visit our main website at www.annamacneil.co.uk - you can buy our products online! Join the Anna Macneil mailing list, and receive all the latest news from Ruth and team. Ruth's Embroidery. Copyright 2010. Theme images by enjoynz. Powered by Blogger.